In the Trump era, liberal media bias is worse than ever. So, it shouldn’t shock us that the Media Research Center’s Newsbusters division probably has carpal tunnel syndrome from jotting down all the insanity that is transpiring across CNN, MSNBC, and the Big Three (CBS, NBC, and ABC). In this media bubble, Trump colluded with the Russians to win an election; he’s a tax cheat, a serial sexual abuser, and the most corrupt politician since Henry Clay and the corrupt bargain of 1824. Outside of this glass case of emotion, the economy is growing at four percent. There are more jobs than job seekers, and job openings are at a whopping 7.1 million. Three million jobs have been created, new trade deals with Mexico and Canada are in motion, the Trump tax cuts have formed a solid base for growth, and more than three million working-class families have received bonuses of $1,000 or more. Oh, and consumer and small business confidence have reached 18-year highs. And did I mention that unemployment is at 3.7 percent. Yeah, things are going well, but the Democrat-media complex is hoping that the president fails, of course. To better Democrats’ 2018 chances, there have been six rather major scandals that have hit some key candidates, which the elite media decided to smother with a pillow. From domestic abuse allegations to fraud and DUIs, Newsbusters’ Geoffrey Dickens found six major scandals, where the elite news media has devoted little to no coverage. 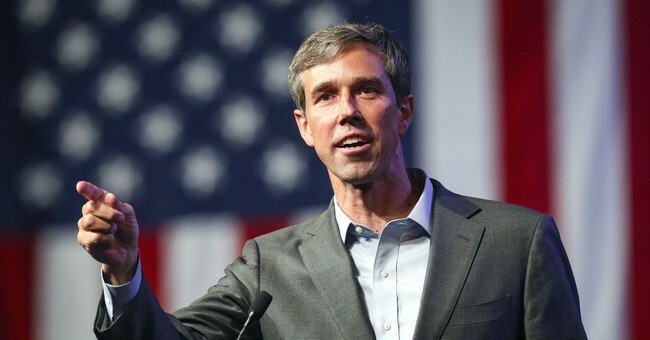 When Texas Senate Democratic challenger Beto O’Rourke lied about a past DUI arrest, it was so blatant even the liberal Washington Post’s fact checkers couldn’t let it pass. During a debate with his rival, Sen. Ted Cruz (R-Texas), Rep. Beto O’Rourke (D-Tex.) was asked point-blank about a drunken-driving incident when he was 26: Did he try to leave the scene of the crash? The Houston Chronicle and San Antonio Express-News had recently obtained police reports of the collision and reported that O’Rourke had done so. O’Rourke responded with what appeared to be a well-practiced answer. He flatly denied trying to leave the scene of the crash but added that driving drunk was a “terrible mistake” and that he would not provide an excuse....The police reports show not only that O’Rourke was highly intoxicated but that a witness to the crash said he tried to leave the scene. CBS This Morning co-host Bianna Golodryga interviewed O’Rourke on the October 5 edition of CBS This Morning, but she never asked about his DUI. Back in April, Democratic incumbent Senator Robert Menendez was officially admonished by the Senate for accepting gifts from a donor in exchange for promoting his interests. The Senate Ethics Committee “severely admonished” Senator Robert Menendez on Thursday for accepting gifts from a wealthy doctor while using his position as a senator to promote the doctor’s personal and financial interests. It also ordered Mr. Menendez, a New Jersey Democrat, to repay the market value of all improper gifts he has not already repaid. Earlier this month, the husband of Missouri Democratic Senator Claire McCaskill was accused of using a government program intended to help the poor, to personally enrich himself. At the height of the Brett Kavanaugh hearings, private information about Republican senators was illegally released to the public. A former Democratic staffer was arrested for the crime. A former staff member for Democratic Congresswoman Sheila Jackson Lee is still in jail tonight. Bail was denied this afternoon for Jackson Costco. He’s accused of committing several felonies including the release of personal information about Republican Senators on the Internet. Democratic candidate for Colorado Governor Jared Polis was accused of pushing a former employee. Jared Polis, the Democratic nominee for governor in Colorado, was involved in a physical altercation with an ex-employee in which he admitted to police he pushed the woman, according to a police report obtained by the Washington Free Beacon. The incident dates back to June of 1999 and took place at an office Polis had in Boulder for a company called JPS International LLC. Democratic Congressman and DNC deputy chair Keith Ellison, back in August, was accused of physically abusing an ex-girlfriend. Let’s be honest. We all know this game. If these were Republicans, the media would have peddled a narrative of scandal and sleaze that would have saturated this election cycle. It must be nice to be a Democrat. You can lie, cheat, steal, and (allegedly) beat women with zero consequences because there will always be an expansive media complex that will give you tons of cover. Same as it ever was.